Maywood, IL -- Maywood, IL - Harley-Davidson's newly redesigned FLTR Road Glide represents the latest in touring comfort, and the triple-vented shark nose fairing is perfectly complemented in both form and function by National Cycle's VStream Windscreens. VStream's cutting-edge aeroacoustic contour features a wider profile at the top, which pushes turbulent, noisy airflow to the side and away from the rider's helmet. This extra width creates a quiet pocket of air with significantly reduced helmet buffeting for a calmer and quieter ride compared to the stock screen. VStream windscreens are made from tough 4.5mm Quantum® hardcoated polycarbonate. Our state-of-the-art manufacturing techniques combined with this high quality material provide outstanding clarity and strength characteristics unmatched by any windscreen maker worldwide. Our exclusive Quantum hardcoating makes the VStream 30x more scratch resistant than acrylic, and 10x more than standard hardcoated polycarbonate -- ensuring that your windscreen will stay clear and strong for many years to come. 3-Year Warranty Against Breakage and Are Proudly Made in the U.S.A. Available in three configurations: the Low Windscreen with a Dark Tint (Part #N20433), the Touring Windscreen with a Light Tint (Part # N20432), and the Tall Touring Windscreen with No Tint (#N20431). 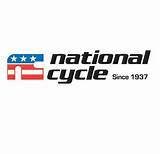 From our premium quality, quick-release SwitchBlade® windshields to our universally renowned VStream® sport/touring windscreens, National Cycle has earned its reputation as the Worldwide Leader in Windshield Technology. No other company comes close to the range of innovative products made for your motorcycle and the way you ride.